For Answers to Your Needle Felting Questions! Just what is needle felting? I like to describe needle felting as sculpting by stabbing. Technically speaking, the craft of needle felting involves using a single, barbed needle borrowed from commercial felting machines. Wool fibers are tangled and compacted by repeatedly jabbing the needle into the fibers, forming three-dimensional felt sculptures bound only by one’s imagination. In contrast to traditional felt making methods that use water and friction, needle felting is also known as dry felting. Sculptural Needle Felting is just the coolest thing! First of all the most common medium is wool… Let’s thank the sheep for growing such amazing fiber. I really have a hard time describing the feeling of creating with wool. It must be the organic nature of it that appeals to me; the luster, the smell, the feel… it really is wondrous stuff. The quiet crunching sound that the barbed needle makes as it pokes in and out of the wool is quite soothing. But the greatest thing of all is the moment that lustrous pile of fluff transforms into a character full of charisma and charm. The needles used for needle felting were not designed for hand crafting – they are designed for industry. At the turn of the 20th century, machines with beds of these barbed needles were invented to tangle fibers into felt fabric. These machines are still being used today to make industrial felt out of a wide variety of fibers. The next time you open the trunk of your car, you will know the thick liner was made with felting needles. It wasn’t until the 1980’s that an innovative fiber artist, Eleanor Stanwood, considered the use of single industrial felting needles as a means to sculpt wool into 3 dimensional shapes. The story I heard was that these needles then landed in the hands of California fiber artist, Ayala Talpai and the needles soon made their way across the big pond to Birgitte Krag Hansen in Denmark. Birgitte had been sculpting figures out of wool using wet felting methods but the felting needle changed her approach to sculptural felting. Ayala and Birgitte became early pioneers in the art of needle felting and have both written several books on the subject. Sculptural needle felting is quickly growing in popularity and am honored to carry the torch and pass along the magic that I was lucky enough to learn from Birgitte when she traveled to Alaska to teach workshops in 2007. Thanks Eleanor, Ayala and especially Birgitte! I wish I could say to just run down to your nearest craft and hobby store and pick up everything you need to get started with your needle felting ideas. Unfortunately, it’s not that easy. You may find small packets of fibers and expensive felting tools that hold several needles – these are generally for flat needle felting techniques used in embellishing garments and accessories. Even if you happen to have a fiber shop in your neighborhood, the chances of having the best wool selections for needle felting are slim. I have found that most shops carry wool prepared for spinners and the properties of wool prepared for felting are much different. But you will find exactly what you need on the internet, most needle felters order their supplies online. It’s important to have some idea of your subject matter when choosing wool. Wool that works great for animals might not work as well for doll making. It pays to do your research. Once you get an idea of the supplies you need, then you might consider some type of workshop or book. Needle felting is very intuitive and can be easily learned without any instruction but books, videos and workshops are always helpful. A basic understanding of the concepts of needle felting, good supplies and a great imagination are really all you need but learning specific techniques is quite helpful and can save you lots of time and frustration. I teach people all around the world through my fun and comprehensive video workshops. How do I choose the right wool and supplies for needle felting? When I first discovered sculptural needle felting on the internet, I rushed down to my local fiber shop and wound up spending so much money on all kinds of wool and elaborate needle holders. After quite a bit of frustration, I set out to find the right supplies that worked best for me. After much research including trial and error, it has taken some doing (and some $$$) but I have finally narrowed it down to my favorites! Understanding supplies for needle felting can be a bit confusing; if you ask 50 different needle felters what they use, you will get 50 different answers. My first suggestion is to find a needle felt artist whose work you admire and find out what they use. If you enjoy my Felt Alive Wool Sculptures then continue on and you will learn all about the supplies I love to use. 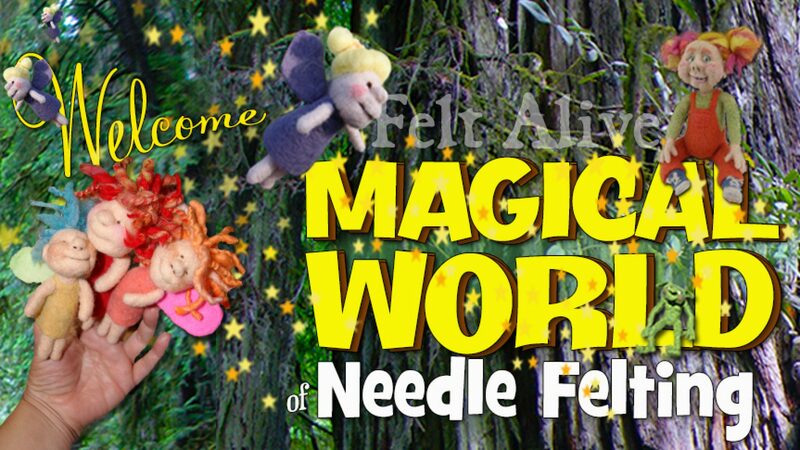 Let’s start with Felting Needles! Felting needles have sharp, barbed blades that tangle fiber into felt with a repetitive jabbing motion. They are quite an interesting crafting tool! Manufactured for industry rather than crafting, they are designed specifically to fit into felting machines that hold thousands of needles. Felting needle selection and use is typically a personal preference. I felt with fine-medium wool batting and typically use use only a few different sizes of needles . For general felting. If I had to pick just one gauge of needle use, the 40t would be it. It pierces into my felting projects easily and seems to grab the perfect amount of fiber with each jab. It also gives me fine control when sculpting the wool. For finish and surface felting – works especially well for finishing the surface of coarse, hairy wool. This is a star shaped blade rather than the typical triangle shaped blade. There are more barbs and the barbs start closer to the tip than most other needles. This makes it a good choice for surface details like eyes and for finishing the piece and taming down the fuzzies. A fine gauge needle, perfect for finishing your projects. For deep, fast felting and attaching parts. This is a coarse needle and more durable than the others. I don’t have to worry about it breaking so when I need to attach a head to a body, this is the needle I reach for. It’s the needle I let kids use when they want to try their hand at needle felting. It’s not quite as sharp and holds up to a bit of abuse. What kind of wool do I need for needle felting? There are many, many choices out there. Roving, Tops, Batting…from so many varieties of sheep…and you can even needle felt with other animal fibers like Alpaca. You can needle felt with nearly any type of fiber but for creating lifelike needle felted sculptures, I have found just a select few that work well for me. My Felt Alive dolls bend, move and flex without the use of wire armatures. To achieve that, I need wool that offers special qualities to my finished dolls are well-felted, flexible and durable. As much as I love needle felting, I love seeing progress fairly quickly. Wool that felts fast is a quality that is essential for this impatient girl. Here is the basic lingo that I had to learn once I started needle felting. Prefelt – Wool fabric that is not fully felted. Typically made on a needle loom (a machine that uses lots of felting needles,) prefelt is different than typical felt fabric in that loose fibers remain so that it can be finished by hand felting methods such as wet felting or needle felting. Felt – The end product of all of this! Whether it is a felt garment made using traditional wet felting techniques, a gorgeous Nuno Felted (fiber felted with woven fabric) scarf or a needle felted doll, what you have in the end is Felt !! What kind of work surface should I use for needle felting on? Because felting needles are sharp and fragile, it is very important to have some type of firm, yet resilient work pad that will hold up to all of the stabbing that goes along with needle felting. If your surface isn’t resilient enough, you will find yourself breaking needles – if it is too resilient, your needle will travel right through it and likely break when it hits the table. I have tried using a folded towel, old couch cushions, pillows, foam garden kneelers. At most craft stores, you will find small brush mats for needle felting. They look like scrub brushes and are designed for flat needle felting – such as embellishing a small design onto a sweater or felted bag. When I first started felting I primarily used upholstery foam as my work surface. This worked ok but I didn’t find it to be dense enough. My eyes go bonkers if my project bounces too much so now I use a high-density foam that supports my project as I stab away. The foam I use is much more firm than typical upholstery foam and holds up to heavy needling.